It explained how it sends alerts to pensioners and those with families or disabilities 75 seconds before their train platform is confirmed. The head start lets them avoid the ‘surge’ and reduces overall traffic on the concourse. That way, everyone benefits. The use case is an elegant example of how simple SMS can improve customer experience. But imagine how much better it could be if those text messages included richer elements – like maps, seat locations, refreshment ordering and payment options. 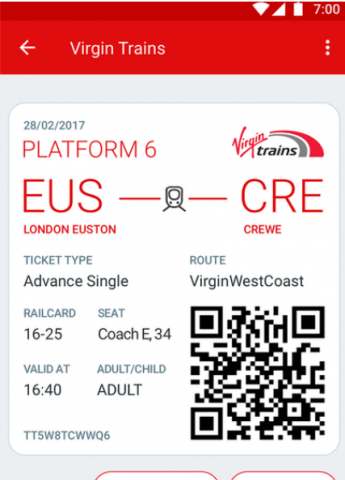 This is because OpenMarket, which serves as the messaging provider to Virgin Trains, is one of the official partners of Google’s Early Access Program to bring RCS rich messaging to brands like Virgin. RCS, of course, is sometimes known as SMS 2.0. It brings the functionality of OTT messaging apps to the standard messaging system used by operators. In other words: group chat, graphics, video, voice, delivery receipts, maps, menus and maybe even payments. MEF Minute readers may be aware of RCS’s uncertain history. Work started first on the platform in 2008, but little progress was made until 2015. It was at this point that Google bought Jibe (an independent company that specialised in building RCS services). In February 2016, the GSMA confirmed that major operators would work with Google on progressing RCS and that Google would build a single Android RCS client based on a universal RCS profile the operators all agree to. Since then, many major operators have committed. Sprint launched RCS messaging to its customers using Android devices, and Telenor also agreed to roll out RCS to its 214 million subscribers across Europe and Asia. So RCS is making progress. But the messaging sector doesn’t want to position the standard as purely for P2P. Its equally keen to address the enterprise space. Which brings us back to Google’s Early Access Program. As one of the official partners, OpenMarket is working on use cases of RCS with clients such as Virgin Trains, FICO and Sky. At Mobile World Congress, it revealed a working demo of the Euston station project. Steve French, global VP of product management and marketing at OpenMarket, is excited about its potential. He says: “It’s really like an app experience without the app. Customers can see the seat number, a map of the concourse and so on, so they’re really getting a much deeper experience. The interactive elements can save time and money too. French says alerts sent by delivery companies or those dispatching engineers to households (these include current client Sky) could include menus for re-scheduling appointments. 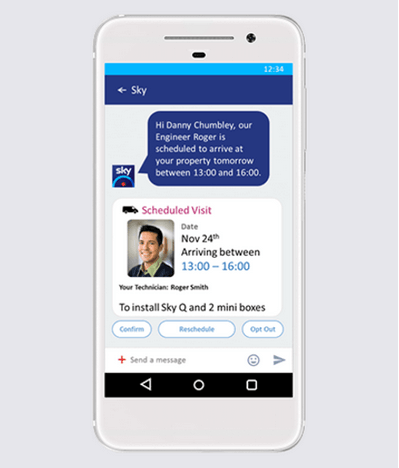 “We’ve shown how SMS can save money by reducing wasted visits, but if a householder can book an alternative slot from inside the message, that’s an even bigger saving. And customers like it too because it’s a huge improvement on making a voice call to a call centre,” he says. Needless to say, these exciting possibilities depend on the continued roll out of RCS to operators and handset makers. Google seems determined to maintain the momentum. Last month, it announced partnerships with 27 carriers and device manufacturers (including Samsung) to launch RCS to Android users worldwide, saying a billion Android phone users will have access to RCS messaging on their devices.